What is the difference between recycled content vs. recyclable content? Well there’s a big difference between the two, but sometimes they are easily confused! 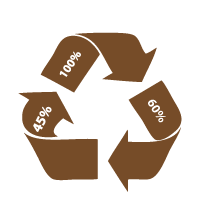 First and foremost, all of our carboard is 100% recyclable. The other plus when looking at corrugated material is that it comes from a 100% renewable resource. Cardboard is also biodegradable. All of our cardboard has a percentage of recycled content. Our cardboard is approximately made up of 60% recycled content. Contact us and we’d be happy to answer any of your questions!